You are here: Home » Featured » Which is Real: Science or God? 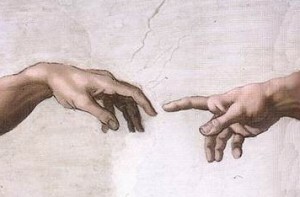 Which is Real: Science or God? As physics and chemistry became more sophisticated–quantum mechanics and electrodynamics–the experiments, the thesis work verified H psi = E psi, Maxwell’s equations, and the Second Law. But very few atheists and agnostics–journalists and politicians for the most part–have had this experience. Nevertheless, they believe what “scientists” tell them about the world as an article of faith, not justified by what they themselves have done or perceived. It was only until after retirement that I started looking into the philosophical foundations of science and its various disciplines that I realized that there is a contingent of philosophers–“anti-realists”, “constructivists”, “empiricists”–who question whether there is a reality that lies behind science. Their arguments make sense, but more of that in a later article. I assert that the vast majority of people put a faith in science that is much less justified than a faith in God. In a previous article (Top Down to Jesus) I’ve argued that a rational, historical approach will justify a faith in the Resurrection and in the Divinity of Our Lord. Moreover, the subjective experiences we ourselves have had and that have been related to us, the tested accounts of miracles, are as good evidence for the existence of God as are accounts of scattering experiments for the existence of the Higgs boson. Most people aren’t aware of the distinction between science and other rational enterprises–science requires theory (usually mathematical and linked to other theories, more basic and fundamental), confirmed or falsified by observation/reproducible experiment. Because faith in God is not quantifiable, the atheists classify it as one of the White Queen’s “Six impossible things before breakfast”. That’s hokum! Many rational beliefs cannot be assessed numerically. It is science itself that is limited in that science, in its best and purest practice, is restricted to those tests that can be verified by quantitative measurements. It is faith in God that is most easily tested by the person, in his own experience and by historical evidence.